The rankings are not an exercise in determining who is closest to appearing in the NHL. Players are initially slotted by their top-end potential, and then moved up or down based on their likelihood to achieve. For example, an offensively gifted forward may have top line potential based on junior/college use/production, but factors in their game may impact their likelihood to achieve, and thus *may* be rated lower than a counterpart who is likely to achieve a traditional third-line projection. This is the most practical way to construct a list when evaluating players between ages 18 and 23. You can argue that the hands, vision, sense and overall offensive upside of Mittelstadt and Nylander are comparable. Both are superior stickhandlers and playmakers that bring the ability to string together electrifying shifts in the offensive zone. In the end, Mittlestdt's battle skills, construction of a complete 200-foot game and competence playing the center position give the stocky Minnesotan the edge in settling the top overall spot. Hockey is a game of flow and instincts. Mittelstadt has been a difference maker every shift in every game I've seen him play. He's very agile with fast hands and a dogged work ethic. The kid is a fiery competitor that will pressure the puck, grind along the walls, and simply do what it takes in all three zones for the full 60 minutes. Mittelstadt firmly placed himself on the radar as a high-end offensive commodity following an encouraging performance at the 2016 IIHF World Under-18 Championship, where he potted four goals and nine points in seven games. Instead of accelerating his studies and joining the Gophers this season, Mittelstadt elected to take an extra year to develop and join his childhood friends in pursuit of a high school state championship, and that decision paid off in spades despite coming up short of his ultimate goal. After scoring twice in the 2016 CCM/USA Hockey All-American Prospects Game to snag the game’s Most Valuable Player honor, Mittelstadt began the year playing 16 games with the Green Bay Gamblers of the United States Hockey League, compiling eight goals and 21 points. From there Mittelstadt returned to Eden Prairie High School for his senior season. He’d pour in 21 goals and 64 points in 25 games with the Eagles, along the way earning the 2017 Mr. Hockey Award as the best high school player in the state of Minnesota. Following a loss in the state semifinal, Mittlestadt returned to Green Bay to produce five goals and nine points in the final eight regular season contests, finishing the year with 30 points (13+17) in 24 games to lead the entire USHL with 1.25 points per game. Two years (2019-20) is a comfortable timetable. However, Mittelstadt may very well be a candidate as a “one and done” collegian. The magic/arbitrary number for yanking him out after his freshman season is 45 points. Hitting the 20-goal mark would be great, but if he can get a 17-28 ratio with the Gophers, dominate at the World Junior Championship, and prove that his mind, body and skill set could quickly match up with the world's best, it just may be a good time to get him out. For now, look for him to become an immediate impact player in Dinkytown and one that should be a major player as the U.S. looks to defend its gold medal. A dazzling stickhandler with quick hands and elite vision, Nylander enters his second year in the Sabres' pipeline on a mission to prove that he added strength up top and can thrive in the tempo of the professional game. Nylander's game is fueled by intelligence and shiftiness. He's very good off the rush and can patiently hold on to the puck while his teammates cycle into the offensive zone. Maturing off the puck is always part of the process, but let's face it - the Sabres drafted him for his ability to quickly create offense in the space given to him. The plans aren't to stifle that creativity, but they'll need to get the reps in so he can competently manage his two-way NHL responsibilities and make the most of his minutes when deemed ready. Nylander's rookie year brought the expected peaks and valleys. He got off to a nice start with 16 points (5+11) in his first 25 games with the Amerks, and finished as the co-leading scorer at the 2017 IIHF World Junior Championship, but was unable to take his game to the next level in the second half. Playing on a team thin in veteran leadership under a coach lacking a deep professional resume didn't particularly help matters. While the long-term projection as an elite forward remains in tact, the fact that Nylander had just three professional games on his resume prior to entering the AHL should not be overlooked, either. Now with 69 additional games through his system, including four in the NHL, Nylander needs to stick to the North American program, battle through adversity, and not fly the coup back to Sweden. It's a compelling time for Nylander. We've seen players take dramatic development leaps in their second pro season. Conventional wisdom tells you that another year in the AHL would be best, but a left-wing NHL opening is there for the taking. It's one that can be earned at any point throughout the year. He is eligible to play in his third World Junior Championship, but where I was banging the drum for him to join Team Sweden last year, my position may be a little different this time around. Let's see how his year starts and go from there. Also of note, Nylander's contract can slide for another year if he plays nine games this season. The meter only starts running if he plays 10 NHL games. In the last rankings, I referenced how we often measure a player's readiness by time, but with Guhle I measure him as being X pounds away. The magic number now sits at 10. Based on his fluid stride, he can continue to add that mass up top and not lose a lick of his skating ability, all the while generating more power to fuel his evolving physical dimension. Guhle covers a ton of ice. He received loads of opportunity at the junior level to tune up his shutdown responsibilities in the defensive zone, but the ultimate projection is that of a top-four puck-mover/rush-joiner who can survey the play at an elevated pace and simply take chances deep in the offensive zone that others can't due to his excellent recovery. Entering this third NHL camp, Guhle is penciled in to start the year in Rochester where he'll be relied upon to kickstart the Amerks' attack from the back end. Defensively, he needs to maintain his mental composure in a big-minute role and play instinctive hockey. Chase less, maintain his position around the net, clog lanes and seal off the back door. He is in a spot where he can quickly force upward pressure in the pipeline, but in reality, earning spot recalls while serving as a full-time AHLer could be best for the long run considering his resume includes just 17 WHL playoff contests. Fans always want the shiny new toy in the lineup right away, but the days of on-the-job NHL training should be a thing of the past if you want to be a playoff team. Let him develop. While Mittelstadt and Nylander will reap the accolades with their high-end offensive skill sets, Asplund simply pays attention to detail as a consistent worker who can smartly use his stick, separate guys from the puck and help drive the team's possession metrics. His wits on both sides of the puck will provide a lot of value when he is physically ready for prime time. It's rare to see a player so highly developed at a young age. That's what makes him special. 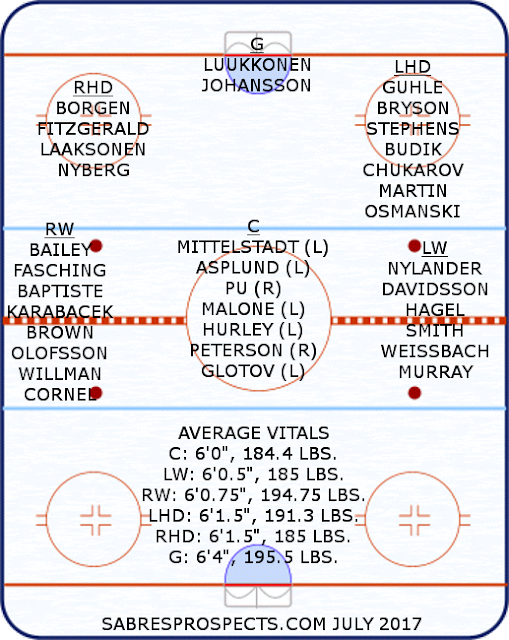 It's clear that Asplund has put the work in to truly understand how to play the center ice position. He's the not the biggest guy nor is he the fastest, but Asplund has the well-balanced blend of skill and peskiness that could see him become unsung rock in the middle of a championship lineup. He does everything with precision, and he possesses sneaky vision with the puck on his stick. He's an astute penalty killer and he's very efficient at the faceoff circle. If he appears to be ahead of Nylander in terms of NHL development, it could be because he has nearly a full season's more of professional experience than his countryman. Asplund, who is not eligible to play in the 2018 IIHF World Junior Championship, will finish out his contract with FBK in 2017-18 with 2018-19 as the target for his North American arrival. He'll be polished and ready to compete for a big league job right away, but the expectation is that he starts his journey in Rochester. The Sabres lost William Carrier to Vegas and went out and essentially drafted his replacement early in the second round of the 2017 NHL Draft. Much like fellow countryman Asplund, Davidsson is a smart two-way worker who has the look of an opportunistic middle-line NHL forward that can thrive in a tight checking scheme and produce offense via hard work. The difference between the two is that Davidsson is more focused on the slot, whereas Asplund is more of a creative player that can find him there. When on his game, Davidsson brings loads of speed and energy. Davidsson parlayed a nice showing last August at the U.S. National Junior Evaluation Camp into a solid year with Djurgardens IF. He played 45 games with DIF’s top club, scoring five goals and nine points while averaging 11:12 of time on ice. He also received work with the J20 team, scoring six goals and 10 points in nine games. A lower-line contributor as a junior-aged SHL player, Davidsson is expected to up his production this season. He is focused on the details away from the puck. He likes to buzz all over the ice, applying pressure with a desire to hit and battle in the trenches. He must continue to work on his offensive skills, but no one questions Davidsson’s ability to play with an edge and take on defenders near the edge of the crease. Buffalo fans will get an up-close look at Davidsson this season as he is expected to play for Sweden at the 2018 IIHF World Junior Championship. All signs point to Davidsson being a responsible low-risk pick. He will agitate, get to the net and get you some goals. Davidsson has one year left on his current deal, and could arrive in Rochester in 2018-19 a more mature player. A rugged, rock-solid NCAA defender, Borgen totes a smart stick and picks his spots well when activating on the rush. Where he differs from Guhle defensively is in the sandpaper element that he brings in the corners and when protecting his goal. Borgen has some nastiness to him. He doesn't mind initiating with a big hit, and he certainly won't back down when poked. Moving forward, coaches may ask him to check his discipline some, but it is a positive not a negative. The expectations of Borgen moving forward have remained fairly straight forward. Lock it down by quickly closing his gaps and pushing the play away from the middle of the ice. Get sticks on pucks. Execute with the calmness and mobility to skate into space and make clean passes out of the zone. Keep his shots low from the point on the power play. While being a good skater, the Sabres would like to see him add a little more speed. The odd turnover has popped up here and there, but for the most part Borgen has proven alarmingly consistent since joining the collegiate ranks. As he learns from those limited unforced errors, it is safe to say he is earning passing grades with flying colors while providing strong leadership to the Huskies' defensive corps. The Sabres will likely offer the steady defender a contract following the upcoming collegiate season, with the future target as a guy that can ride shotgun with a defenseman like Jake McCabe. Luukkonen offers the Sabres a huge, athletic netminder with long limbs that, with more coaching and technique refinements, has all the signs of developing into a legitimate No. 1 NHL goaltender. He takes away a ton of net both down low and up high, but has the footwork and quickness to arrive at shots on his feet and thwart rebound attempts. He reads the play well, but I want to see him have to scramble less as he develops. Luukkonen, who was named to the IIHF 2016 Under-18 Championship All-Star Team after helping Finland earn the gold medal, was set back to start the 2016-17 campaign with pneumonia. While having a solid season with his Jr. A club team (1.78 GAA, .917 save%) that saw him backstop HPK to a league championship, Luukkonen didn't perform as dominantly at the 2017 event behind a much younger and inexperienced Finnish squad, but he was still able to maintain his position as the top European goaltender in the 2017 draft class. With two years remaining on his Finnish contract, Luukkonen will have plenty of time to grow his game. Immediate goals prior to his North American arrival are to lock down the No. 1 role in the HPK organization and be the man for Finland at the next two IIHF World Junior Championships. There isn't any pressure to accelerate his developmental timeline, but it is imperative that he plays the most minutes against the highest level of competition to maximize the key years ahead. With excellent wheels and a keen offensive knack, Pu is in the same bucket as Asplund as far as I'm concerned, making him a valuable prospect thanks to his two-way smarts and versatility. Along the lines of Asplund's development plan, the OHL superstar should be considered a lock to play for Canada when the 2018 IIHF World Junior Championship kicks off in Buffalo. So yes, Pu's offensive numbers are certainly spiking given the elevated OHL role. He understands how to use his linemates while possessing an ability to strip pucks and make things happen on his own. His quick shot from the hash marks down remains an underrated and vastly improved part of his game, and he is very strong at the dot. With that said, though, much of Pu's long-range value as a centerman will be inversely related to his awareness and intensity level. He must continue to show smarts when supporting his defensemen. The points are great and are certainly a requirement to get his game in order for the next level, but I'm looking more at his 200-foot consistency and all of the little tasks a pivot must master as the keys to his NHL future as a centerman. Pu is going to need to be a blazer up and down the middle of the ice in a do-it-all capacity. Keep in mind, I wouldn't at all be opposed to easing him along as a winger when he breaks in as a pro. It may actually make the most sense when building a balanced attack in Rochester over the course of the next few seasons. The Amerks' 2015-16 Rookie of the Year, Bailey continued his development in year two of his entry-level contract as a speedy, athletic winger that can score even-strength goals. Now entering the final year of his deal, Bailey stands out as a player who may benefit the most from new coaches and a new system if the bosses simplify things and ask him to "just play"
You can argue that continuing to pile up goals will be the primary factor in him becoming a full-time NHLer, but the process ultimately boils down to consistently showing hockey sense, processing NHL game speed and playing to his size. Just play...hard. You want to see him do less thinking in the defensive zone and be a more fluid read/react player. You want to see him peel off fewer checks and finish his man. You want him to package his excellent wheels with his size and drive with power. The raw skating skills are certainly in play. Bailey is very determined on the forecheck, and he can take defenders on the rush. The Darryl Belfry-led work regimen that resulted in a more explosive skater was an excellent first step to elevating his game last season. Now the next stages involve improved anticipation and finding the spot spots to use his shooting skills. And of course, he needs to hit the net with his shot. With the work plan laid out, Bailey has the chance to leapfrog some bodies. The key is maintaining the right attitude (I cannot stress enough how important this is), forget about the depth chart and simply focus on the process that is designed to make him a better hockey player. He's always shown that he knows what it takes to improve. A right wing who makes a lot of plays from the left side of the ice, Fasching made the Sabres roster out of camp last season, playing with greater quickness and maintaining his projection as a winger who competes hard, helps drive a puck possession offense and efficiently kills penalties. We've referenced in the past how the Olympic-sized rink at the University of Minnesota forced Fasching to improve his footwork and overall skating game by honing in on more explosive stops and starts. This is the first thing I thought of when Fasching suffered a major groin injury last season. I oddly wonder if the injury was actually a blessing in disguise. Groin injuries are never easy to deal with, but the reality is that he was probably best-served by more time on the farm. Having the game slow down and having a less to deal with on your plate is never a bad way to get acclimated, even if it is just for a brief tour. Fasching himself may not agree, but he just might when someday looking back at his career. Regardless, I always have room for a big, hard-working effort player on my roster. He's a smart one, too, mixing in outstanding positioning and correct plays with the puck per the situation. Fasching won't over-handle the puck, but his size and reach can make him a beast beneath the goal line and a major goal-area presence. He has all the right traits to become a regular 12-15-goal, 30-point guy given the Sabres' skilled group of forwards that should be able find him with his stick down. It's just going to take proper seasoning to make it happen -- even if he isn't that far off to begin with. Baptiste has, unequivocally, been the most challenging player to place in the past few editions of these rankings. This isn't to say I have had negative things to say about him (I haven't) or I have been too critical of his game (I have always liked him for what he is as natural goal scorer and sharp-shooter). Let's face it. All Baptiste has done, going back to every development camp and Traverse City/Prospects Challenge tournament since being drafted, is score goals. He hasn't exactly been given the greatest support on the farm to develop his all-around game, and yet he still produces. And still, despite being an energetic scorer in junior and a 25-goal man last season as a second-year pro, I can't kick the feeling that Baptiste ultimately projects better as a speedy middle-of-the-lineup, dare I say "role" player, when he settles in at the NHL level. I understand he played with Connor McDavid, but maybe he's that valuable support worker that you can move up and down the lineup to spark the offense and throw him over the boards on the power play, where he excelled last season with 11 of his 25 markers. The Ottawa product brings versatility to the right side with his acceleration and willingness to fly into the corners on the forecheck. An upright skater, Baptiste is most effective when he keeps his game in a straight line offensively and comes back to his zone with equal gusto. That's one of the reasons why his ideal role (to me) could be one who can force the play deep, apply back pressure and, since he is more finisher than creator, use his excellent release of the puck to capitalize in open space, especially at the left circle with the man advantage. Trust me, I would love to be incorrect in this thinking and see Baptiste develop into a top-line NHL forward. There's no question the Sabres need a winger to step up, maintain a positive attitude with a clean slate, and force their way into the top of the lineup. However it shakes out, Baptiste illustrates a classic case of patience being required when developing players. Despite a small AHL sample size, some hockey watchers looked at his first-year body of work, and made immediate judgement on his long term probability for success as a professional. Let's just remember that adjustment periods are needed even for players that potted 45 in junior. When JT Compher was traded in June of 2015, one of the underlying thoughts was that the Sabres still had an unheralded effort player in the ranks with Malone. Two years and two surgically repaired hips later, Malone enters the pro ranks with loads of NHL upside. Malone packs similar vision and playmaking skill to that of Compher, but his impact is made with a pesky no-quit attitude that often sees him being the first man in on the forecheck. He can make plays at a high rate of speed, using his feet around the edge to open up defender and his vision to connect with streaking linemates, but his modus operandi has been getting to the net and finishing plays in traffic. His goals aren't easy tap-ins. They're scored with defenders draped on him. To illustrate the effort, you need more than one hand to count the number of goals he scored as he was being shoved to the ice. Of his 18 markers last season, just one was scored on the power play while two came short-handed. When he was on his game, a healthy Malone was among the most effective collegiate forwards. The past few years have seen thickness added to his frame that, when packaged with his massive heart, help him absorb and initiate contact to make plays all over the ice. He has all of the tools to play in the NHL, so this season is all about getting the reps in as an AHL rookie before making a serious push in 2018-19. After logging over 80 per cent of the starts the last two seasons for Almtuna IS of Sweden's second-tier division, Johansson is set to begin his full-time North American quest. A bulky Swedish backstop, Johansson is surprisingly agile and flexible. The big stopper has performed with consistency since being drafted, quietly working on his quickness and puck tracking to his prepare him for the jump to North America. He's patient, waiting to drop into his butterfly, and doesn't spend a lot of time playing on his knees, instead relying on his footwork to maintain his positioning for second and third chances. In seven starts on an amateur tryout last season, Johansson went 3-3-1 with a 2.85 GAA and .892 save%. One of six contracted goalies playing in North America, the 2017-18 season likely sees Johansson applying his craft in Cincinnati of the ECHL with a plan to get him some AHL action as the season progresses both due to injuries and merit. Goalies need reps. If he does well with the Cyclones, he'll get his looks with the Amerks. A steady puck-moving defenseman with clear edginess in his game, Fitzgerald has the look of No. 6 defender with power play acumen. He likes to move the puck around and step into big shots from the point when given a look. Fitzgerald has average speed that sometimes sees him challenged in 50/50 situations, but overall he's able to stay in plays with his positioning and active stick. Most importantly, Fitzgerald likes to toss his body around. His willingness to engage by meeting the rush and launching himself into guys along the boards shows the fearless, disruptive attitude that gives you positive signs for an NHL future when combined with his ability to add even-strength offense (just four of his 22 points last season came on the power play). A clear determining factor with Fitzgerald as it relates to his potential is the great amount of confidence he plays with. Some players will make a poor play and it stays with them with for a few shifts. Not Fitzgerald. If he gets beat on a play, Fitzgerald has consistently demonstrated the ability to bounce right back with a string of good shifts. This tells a story about his competitiveness, but also the mental toughness that will often make or break players when they hit the pros. I expect Fitzgerald to be a major force this season at Boston College and have the Sabres come calling for a contract as soon as his season ends. A tenacious bulldog who stood out at the 2016 Development Camp with his willingness to launch into corners and battle beneath the goal line with his stick on the ice, Hagel enjoyed a breakout 2016-17 campaign on the Rebels' top line. He put up a load of points. He scored clutch goals with eight of his 31 markers being game-winners. He engaged in plenty of post-whistle scrums and even dropped the mitts for three scraps. A great sign of encouragement was the upward trend in his game all season long. He went without a point in his first three games of the season, but never went more than two-straight without one the rest of the way. He connected for a two-goal, four-assist game in January. He posted four-point nights in three of his last four regular season games. He stayed hot in the playoffs, with seven goals in as many games. Hagel's sparkplug mentality around the net could be a very useful NHL resource once he adds mass to his body. Think of a less obnoxious Andrew Shaw type of player using speed and peskiness and he goes up and down the wing and bulldozes into corners. With a short, motoring stride and a persistent work ethic, Smith has a nice foundation in place as a speedy goal sorer with a good handle on the puck and a creative mindset. He takes away time and space on the forecheck and thinks the game at a high level, knowing exactly what he's going to do with the puck before getting it on his stick. Smith no doubt looks like a player that can make a serious push for full-time NHL duty, but priority one is getting professional confidence going and standing out among a mass of worthy wing prospects. A player like Smith, who isn't exactly a defensive zone stalwart, cannot afford to be streaky. He needs to create and finish with regularity, and for his sake, there's a fairly decent chance that he will. It's the Frank Vatrano concept. Get the puck and score. Even though he was inked by Murray, Smith will no doubt get his chances when earned. Botterill has a nice track record with players that have excelled at UMass-Lowell. Scott Wilson (drafted), Ron Hansey (acquired) and Chad Ruhwedel (acquired) all won a Stanley Cup in Pittsburgh. Another, Dylan Zenk, was signed in April as a free agent so you can bet that Botterill has a good grasp on what Smith can do. It's a big season ahead for Karabacek, a soft-handed north-south player who is still finding his range entering the middle of his three-year entry-level deal. Karabacek at times dominated games at the junior level, picking up his intensity level and skating with a greater sense of urgency in key situations, but with the clock ticking a little louder and a new GM watching, Karabacek needs to use his developmental time wisely and work his way into a consistent, competitive groove. He needs to play with energy in all three zones, battle on every shift for a full sixty minutes, and produce 15-20 goals and 40-ish points to prove that he can become a more reliable threat. Botterill and company will provide him the time needed to take the next step, but perhaps some good health juju would help as well. After poor discipline and a broken thumb kept him from playing in two-straight World Junior tournaments, a back injury caused Karabacek to miss the first third of his rookie year in Rochester. He came back and shredded the Coast League during his rehab assignment, and posted some fairly decent numbers on a weak Amerks squad. Yes, 3-5-8 in 23 games is acceptable. In their first 23 AHL games in 2015-16, Baptiste produced 3-6-9 and Bailey connected for 2-6-8. While it would have been nice to see Karabacek take off from the get-go, his trend line is fairly normal given the adjustment needed. An offensive defenseman who likes to skate with the puck, set up the offense and jump up as a trailer, Laaksonen expected to be drafted, as he was in talks with a number of teams leading up through June, but definitely thought it would happen a little later than when Buffalo selected him near the end of the third round. Laaksonen got a late start to last season after a bout with mononucleosis, notching 10 assists in 10 games with the Junior B squad before assuming his spot on the Junior A team. With strength and stamina close to restored, Laaksonen unloaded six goals and nine points in 27 games. Now an NHL prospect for an organization that clearly wanted him, Laaksonen is reportedly training with the likes of 2017 first-rounders Juuso Valimaki and Henri Jokiharju as he prepares what for he expects to a big year with the Ilves organization. He is expected to log major minutes at the Junior A level again, but Laaksonen is immediately focused on making the Liiga team. A mature, highly intelligent player that stems from being a lifelong student of the game, Brown demonstrated significant growth in his game as a sophomore, moving from a first-year player used in mostly guarded minutes to a season-long, top-six offensive fixture for the Eagles. He came out bigger, faster and stronger in his second collegiate season, and the offseason work provided valuable results. With the body now matching the mind and the offense matching his off-the-puck effectiveness, the upside for Brown is really coming into focus. He played on the top power-play unit last season and manned the right wing on the Eagles' second line, nearly tripling his freshman year point total. He basically served notice that he is a legitimate NHL prospect. Brown uses his well-honed skill and understanding of the game to make subtle yet very meaningful plays. He is precise with his attack angles on both the forecheck and backcheck. His sense for the game sees him know when to hold it and when to dish. He has great awareness in all spaces and situations that sees him in the right place at the right time to intercept a pass or hit the right spot to generate a quality scoring opportunity. When an undersized defender catches a scout's eye, it's always because of two things. Speed and skill. What Botterill sees in Bryson is probably what he saw when bringing Chad Ruhwedel to Pittsburgh. An efficient puck-moving defender, Bryson relies on his excellent feet to play an effective two-way game. He brings a creative offensive mindset to the table, be it as a confident puckhandler or as a precise passer that adds spice to the power play, and he is very good with his defensive positioning and break-up ability as well. Bryson's superior four-way mobility features excellent pivots that he uses to angle off the attack stay tight on his check. Bryson excelled as a Hockey East rookie in 2016-17 playing the majority of his minutes with one of Vincent Desharnais or Anthony Florentino, notching 20 points (3+17) to finish third in scoring among the conference's rookie defenders. Half of his points came on the power play. The Sabres will want to stay close to his development over the next two seasons as other blueline contracts come of the books. Adding a few more goals to his total would be a nice bonus, but it's certainly not vital. If he keeps circulating the puck, racking up assists at a high rate and adds to his upper body strength, the Sabres may look to get him in the system for the 2019-20 season. He has boom-or-bust potential that is worth taking a chance on with a contract following the 2017-18 season. Every organization can use a sniping trigger man and he fits the bill. With a Mats Zucarello look to him (Zucarello also developed with MODO), Olofsson is perhaps the best shooter among the Sabres prospects. His vast array of shooting skills include his ability to stroke a power-play one-timer, both while playing the point or operating on the half-wall, and often see him fill the net off the rush. He has all the potential to become a dazzling North American scorer, but that projection is still a few years off as Olofsson has the look of a longer project. With the offensive side of things coming along nicely, the next stage of Olofsson's advancement is all about strength development and his play without the puck. He's a very quick player on the big European ice, and that speed will lend to his defensive zone work with better consistency sticking with his assignments in a system. I like this player and can definitely see him being a real solid AHL-level performer upon his graduation from Brown. A character forward who can pop in some goals, Willman is a battler who works his tail off and does the dirty work for his linemates. He can surprise you with a slick pass that shows just how well he reads the action, and he possesses a nice set of hands around the net. Top to bottom, Willman checks all of the boxes for attributes that Botterill will be looking for when amassing organizational depth. Willman's sophomore season ended with six points, over half his season haul, in his last seven games, and it served a solid springboard into his breakout year in his third collegiate season. Willman took the next step both physically and statistically as a junior, scoring 11 goals and 26 points in 31 games for a Bears club that managed just four victories. Willman has no doubt blossomed over his time at Brown. It's reasonable to think another dramatic leap in production is doable, so his effort and fearless attitude make him one to watch this season. Another in the long line of athletes assembled by the Sabres scouting staff over the past couple of drafts, Stephens is highly mobile, a trait that has seen him gradually break out away from his a stay-at-home presence and join the offense. Still, the hallmark of his game is d-zone work. Yes, he can skate very well, but when an outlet isn't available, Stephens seems content in knowing that up the glass and out is a good thing. This isn't a shock given that he developed with a Kelowna franchise known for developing quality professional rearguards. For a defenseman given his physical attributes, that's a smart way to build yourself up as the rest of his game develops slowly over the next few seasons. He's not overly physical, but he's certainly not shy about using his body to make a play without giving up his positioning. Still, a key factor moving forward will be Stephens getting stronger on his feet. Like so many prospects at his point in time, it's all about strength development up top and down low. The Rockets also afforded quality game opportunities, with Stephens picking up 52 games of WHL postseason experience and another five at the Memorial Cup. The right-shot rearguard answered some questions last season when he broke into the UConn lineup for the second semester after beginning the year with Madison (USHL). For starters, the lanky Swede immediately show that he is a physical defenseman who can get shots to the net and isn't afraid to jump up and start the offense. Nyberg keeps it pretty simple in his own zone. He's a relatively smooth skater than can cover a lot of ice at both ends with his long stick and decent agility. He's calm with the puck and he's been fairly consistent with his decision-making, especially when he given room to play with on the power play. If anything, you want to see him get stronger on the puck and show more command with it on his stick. Be more authoritative. Add some zip to his passes. Nyberg was thrown right into the thick of things upon his arrival in Storrs, snagging a spot on the second defensive pair while being sent out on both side of special teams. He'll need to keep growing his game over the next two seasons, but the tools are in place for a decent organizational depth option once his collegiate agenda is complete. The smooth-skating Budik came along nicely last season as he shouldered a big load on the Raiders blueline following the mid-November trade that sent Guhle to Prince George. He saw big minutes in all situations and was basically a bright spot in an otherwise down year for the Raiders. He even earned a sniff as an extra with the Czech's World Junior entry, setting the table for his inclusion on the roster when the tourney comes to Buffalo this winter. The greatest sign of progress came in his assertive nature when given the increased role. He possesses some nice speed, and he really started to use it with regularity in the second half of the season in an effort to jumpstart the offense. The Raiders were in or near the WHL's Eastern Conference basement all season long. The fact that Budik, defenseman, was second on the team with 25 assists is noteworthy given the lack of firepower around him and the fact that the opposition often dominated possession time. To further accent his progression, Budik earned 12 of those helpers in the final 14 games as the Raiders trended upward as a .500 club in the final five weeks of the season. I'm personally exercising cautious optimism in expecting all of the bottom pairing/organizational depth potential that Budik has to come together in 2017-18 as he looks to earn an entry-level NHL contract. The NHL game is all about speed. Entering Weissback, a shifty blazing winger made a mark in his first North America season by leading Tri-City in points as a 19-year-old and earning a scholarship to Badgerland. Weissback is slick and crafty, be it by getting a step on a defender and streaking to the post to finish a play or sneakily working both ends of a give-and-go. I can see Weissbach excelling in the B1G and flying up future editions of these rankings. Jumping right in to the Wisconsin lineup and becoming an immediate contributor is the first required step to that happening. It's clear that Cornel has put significant time and energy into both his strength and skill development, so now entering year two of his entry-level he must continue making smart plays in the neutral zone and subtle advances along the wall. While he has shown bursts of quickness in small spaces that has allowed him to jump through seams on his way to the net, Cornel will still want to work on his overall speed as that simple ability to compete for pucks could be the make or break factor to how far he takes his career when matching the next level of competition. We've hit on this with Hurley in the past -- it's a phased process to develop a player with his vision and playmaking skill set. As his strength builds, Hurley's overall confidence elevates. This is exactly how it went down in his sophomore and junior collegiate seasons, resulting in increased ice time, including work at the point on the power play, before an undisclosed issue prematurely halted his third year in South Bend. It's all about Hurley showing the willingness to hit the tough areas moving forward. The upcoming season, Hurley's fourth and final collegiate stanza, will require dramatic developmental leaps if Hurley is to achieve his NHL aspirations. I won't at all be shocked if he's one of the surprise standouts when the Sabres hold their 2017 Development Camp. The hulking power forward is in project mode, possessing the raw offensive traits that lead you to believe that he can breakout into a dominant puck-possession hammer at any moment. In reality, he needs some time. Murray is a powerful kid who can take defenders around the edge and excel in the 10-foot radius. Once he works his way into the system and speed of the two-way college game, Murray will likely vault up the rankings. We just need to see the sense and production before doing so. There were minimal expectations for Murray when he joined the Nittany Lions at the midway point of last season. A nifty little playmaker, Glotov adapted well offensively in his first foray into North American hockey last season. He learned that he needed to go to the high traffic areas, used his quick wrist shot to score, averaged nearly two shots on goal per game and came away with a 46.6 per cent success rate at the faceoff circle. He's very much like Olofsson in the sense that he really needs to focus on strength development moving forward. We're just not sure where that next stage of his development will take place. Cape Breton will not use and overage spot on an import, so they'll either trade him within the league or release him to sign with an interested CHL party. Playing outside of the CHL is always possible, but right now it makes the most sense to keep him in North America junior, add mass and play a big-minute role. A swift-skating forward with a very good shot, Peterson got off to a hot start this past season with 12 goals in his first 17 games. It was a bit of a revelation given how he he potted just four in his previous season as a freshman, but he unfortunately went a bit cold down the stretch with just four markers in his next 21 games and ended the season in lower line duty. Petersen, who will be 24 years old when his senior season begins this fall, has the wherewithal to blow the doors off the NCHC this season and work his way into a contract for next season. The thick-bodied defender competed as a 21-year-end sophomore this past season, using his cannon of a power-play shot and puck moving mindset to contribute eight points (2+6) to a a Minutemen squad that won just five of their 36 games. What the Sabres have in Chukarov is a lottery ticket - a late round pick who has the size and offensive tendencies to perhaps someday earn a deeper look at the pro level. He'll get some help on the blueline this season as the Cale Makar show comes to Amherst, making him a player that could easily double his previous year's point total. A two-way depth defenseman, Martin controls the puck well through all three zones and holds up fairly well in the face of pressure. Martin can skate the puck out of trouble and distribute it with poise and confidence. He doesn't try to do too much, but he's effective with what he does. Young defenseman need reps when working on their games. As it stands entering year two of his deal, expect Martin to battle Devante Stephens for that spot as sixth Amerks defeenseman with plenty of Coast League minutes being the primary developmental vehicle. A long-limbed defender who can play a rough and tumble style, Osmanski's marching orders in his draft+2 season are simple. Use your skating game. Be more assertive taking the puck out of the zone against younger competition. Be in command defensively. Osmanski has the size. He has the footwork. He makes a solid first pass. Osmanski's ability to earn a professional contract will be tied to how well he owns his space over the next calendar year.